Some unis here will give monetary incentives for you to publish. I've heard of anywhere from $500 to $20,000 depending on where you get published. 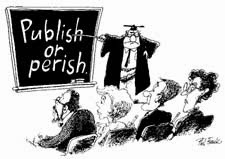 While publishing does have advantages for both the university and the teacher, it also has distinct disadvantages. Teachers are meant to teach, not do research. While I realise that action research compliments teaching, it's getting to the point that universities are requiring more and more of teachers and offering less and less in return. There's also the time issue. Having been published myself I know that it can take a long time for peer-reviewed articles to come out. I've had articles come out in a few months, but some places may take years. This means that a teacher has to constantly submit different articles to different journals and hope that at least one gets published in order for them to keep their job. Another issue is that universities are hiring famous teachers, but they're not teaching. They're spending most of their time researching while a TA teaches the class. There are many problems with publish or perish and I think that universities have to take a closer look at how they go about this.